Ecommerce Web site designers Chesapeake VA | VISIONEFX provides web design in Chesapeake, VA. 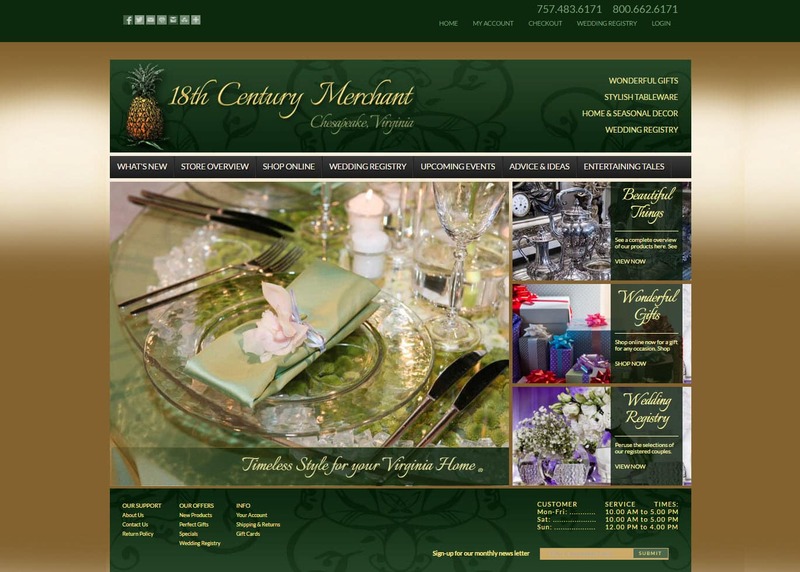 This is the 2nd redesign for 18th Century Merchant since becoming a VISIONEFX client many years ago. 18th Century Merchant, based in Chesapeake Virginia, has a brick and mortar store location with a large local following. As a gift store and wedding registry services, 18th Century developed a successful e-commerce website plan in order to provide online sales. The site was developed using the Joomla web development CMS framework and the open source shopping cart module Open Cart. Custom programming was performed to manage the separation of ecommerce products for the general public and specialty products for bridal registry only.